The Seasoned Pork Kebabs are pronounced with bold flavor and deep in dimension. Thick and meaty, the chunks of pork are always generous in size and flavor. Simple herbs and spices have been masterfully blended in-house over years to achieve a complex flavor that is characteristic of the Meaty Meats Seasoned Pork Kebabs. We start with only prime cuts of natural pork free of animal by-products, growth hormones or antibiotics so you can be confident you are serving the finest quality product. We then artfully season the pork with a balanced blend of herbs and spices that are there to enhance the natural goodness of the pork so it is never overshadowed by phony sauces or concoctions. At Meaty Meats, we strive to meet your expectations of quality and taste. Good intentions and care go into all of our products. Our skillful taste artisans flavor and test all of our recipes in our own kitchens where only true authentic tastes can be achieved, not doctored in a scientific lab. You’ll know it when you taste it! If you haven’t tried our Seasoned Pork Kebabs, do so today. If you have, you know that they are the very best kebabs you’ve tried and the taste keeps bringing you back. 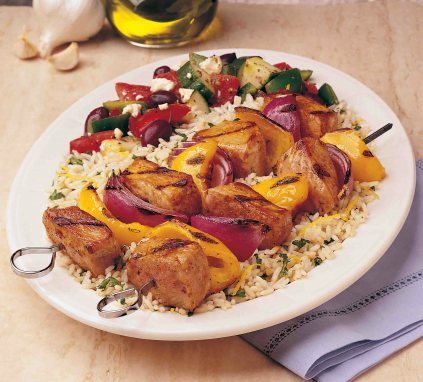 Feel free to try our Seasoned Pork Kebabs recipes by linking to our “Recipes” section.